Apologies for getting yesterday’s post up 14 hours late. 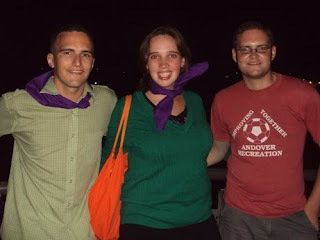 There was boxed wine at the Survivor party, and if this blog was Superman, boxed wine would be kryptonite. I’m already back on schedule today, so you can rest easy once more. Sunula was not in class on Monday, but she was there today and she was her charmingly sassy self once more. I think any fallout from last Friday’s tears has been largely avoided. Last week I saw a female year 13 ask a male year 13 to fix her ’ie because she had coconut cream on her fingers. He tucked an end of the fabric at the base of her back. It was the kind of intimacy rarely seen in Samoa. I tried asking the kid about it the next day. While my questions were genuinely inquisitive, it only sounded like an inquisition. “Why did you do that? Would you have done that in front of a Samoan teacher? What would happen if another teacher saw?” I couldn’t escape the accusatory tone, and the kid clammed up. I got my hair cut yesterday, but the guy who’s usually working was with another customer. A tall kid in a FUBU t-shirt motioned me to come and sit in his chair. He gave me the sole treatment, leaving a patch of longer hair at the front of the top of my head and longer down the back of my head so I could achieve the look of a skunk. Fortunately, the usual guy finished with his customer and shooed away the kid cutting my hair. Very lucky. Koa and Caroline informed my September 9 was International Beatles Appreciation Day (9/9/09). I missed it. Damn. 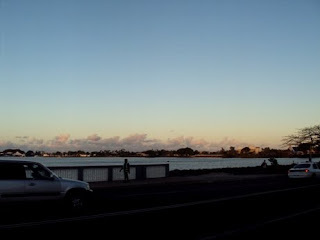 The fall equinox also came and went. No, the leaves don’t change here. Three girls from Samoa College have caught wind of our year 13 camp, and they’ve been crashing our party. It strains the dynamic and cramps my style. Maybe I should send them back to Samoa College. A patch of the antireflective coating on the right lens of my glasses has worn off, and it’s easy to see when the light catches it just right. I have another pair of glasses I’ve been keeping in a Ziploc bag, but I’d rather stick to these until it’s absolutely necessary for me to change. This climate kills things, and I want to keep the fresh pair fresh until the halfway point of my time in Samoa at earliest. I think I might buy an ’ava bowl sometime soon. Phil bought one to give to his brother who just got married. Erik has talked about going to the art school in town known for making nice ones to try and work out some kind of deal. I’m kinda partial to just heading down to the flea market to see what I can find there. Although most of those bowls were probably made in China. Little by little, the weather is getting warmer and with the heat comes the mosquitoes. I do a good job of keeping my house mosquito free, but I’ve been out and about quite a bit recently, and they seem to be everywhere and at all hours of the day. I’ve been missing pita chips lately; the sea salt ones from Trader Joe’s. Incidentally, I wonder how long it will take me to stop calling it Farmer Joe once I move back to The States. That’s all I got for today. I hope you’re well. Pictures below. Camp was canceled from 4:00 to 5:00 today so the year 13s could play sports. 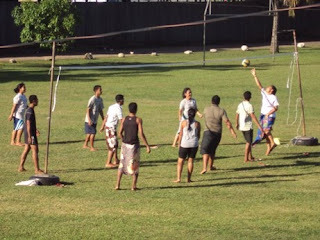 These ones played volleyball and a bunch of the girls played rugby. 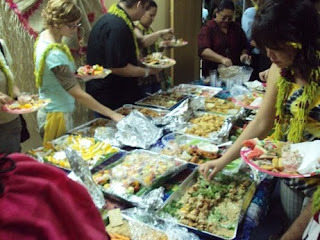 The catered buffet at last night's party. Cake at last night's party. 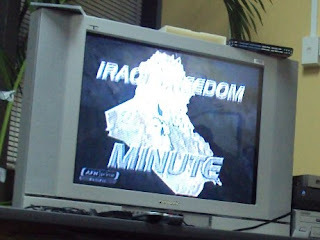 The episode we watched was recorded from the worldwide Air Force Network, which features a regular segment during commercial breaks entitled "Iraqi Freedom Minute." That spread looks pretty good. Roasted pig and trimmings. And you said wine! 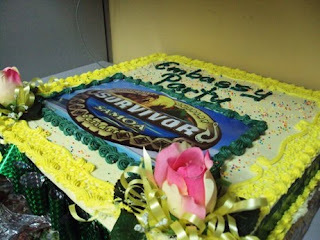 Who knows the Survivor staff well enough to get a logo for the cake? Sounds like a Super Bowl party. I take it that this is not going to be a weekly get-together. You're doing a lot better than the PCV who I heard about yesterday - he's in Zambia living in a mud hut 5 miles from the nearest phone. 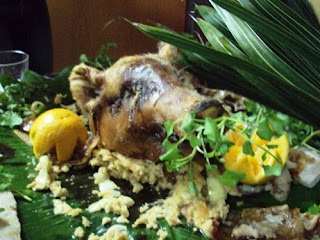 I am not a pig head fan. Reminds me of Jeanne's wedding in Minnesota. Wait, I had a very fun time at the wedding. Just not a fan of the pig. It sounds like you are doing well! We miss you.